Opened with the Barnwell Junction - Fordham line in 1884, this station was originally named 'Bottisham'. It was located at the northern tip of the village of Lode and 1¾ miles from the centre of Bottisham. This peculiarity was not uncommon with rural railway stations and came about because of the naming of stations after the parish in which they were situated, rather than the nearest village. 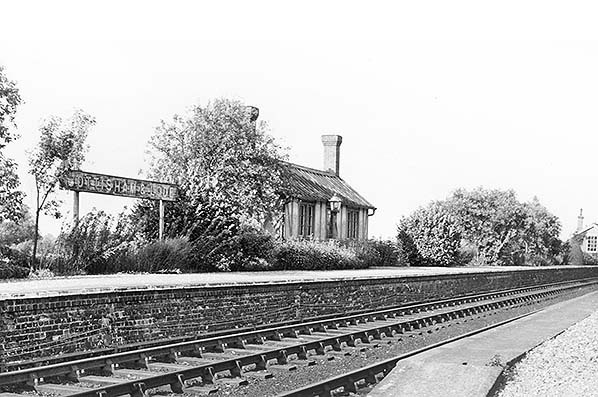 In 1894 the village of Lode became a parish in its own right and on 22 April 1897 the GER renamed Bottisham station to Bottisham & Lode, no doubt following local pressure. 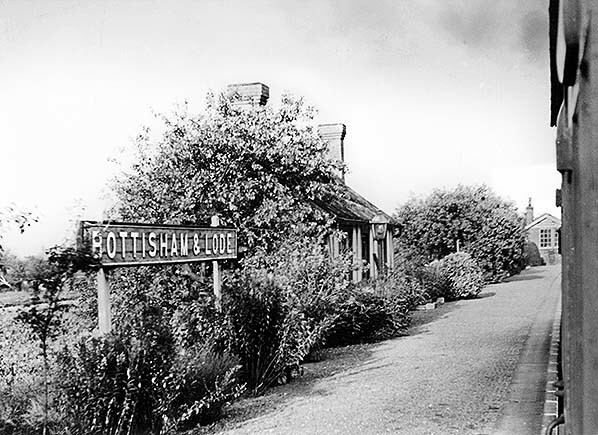 As far as the station itself was concerned, photographic evidence tells us that only the running-in boards were altered and the name on the oil lamps and on the signal box remained 'Bottisham'. The revised name on the running-in boards used an ampersand (&) but timetables usually used the word 'and'. Tickets, or at least a selection which has been seen, bore the ampersand style but some BR tickets exist which were printed for excursion trains and gave the name only as 'Bottisham'. The station was never to receive any form of BR signage. The population of Bottisham in 1881, three years before the railway opened, was 1555 and by 1901 it had dropped to 1283; it then roller-coastered through the twentieth century until 1951 when it stood at 1363. A dramatic drop followed to just 975 souls in 1961. This was typical of rural locations at the time, mainly due to younger people moving to towns and cities for better - and better paid - work opportunities. The drop to the 1901 total of 1283 can be partly explained by Lode ceasing to come within Bottisham parish in 1894. The population of Lode itself also fell, from 790 in 1881 to 659 by 1901. It had also roller-coastered to reach a high of 895 in 1951 before a plummet to just 607 in 1961. Although the populations of Burwell and Mildenhall increased during the 1881 - 1961 period, the falling populations elsewhere did not bode well for the Mildenhall branch despite economies made by the GER and LNER. Discounting Barnwell Junction which had curved platforms only at its southern end Bottisham, as we will refer to it, was the only station on the Mildenhall branch-proper to be built on a curve. It was of 50 chains radius. 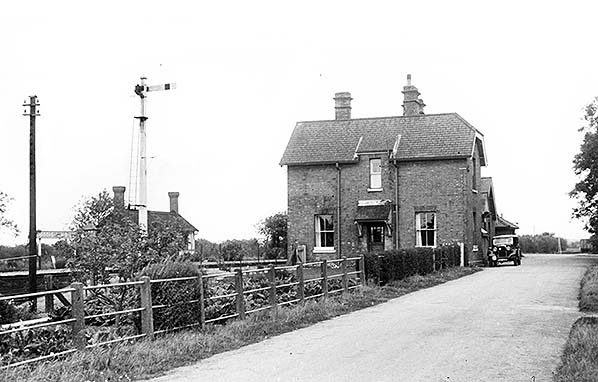 Located 6 miles 5 chains from Cambridge, Bottisham was the first train staff station after Barnwell Junction, and the signal box continued in use until closure. 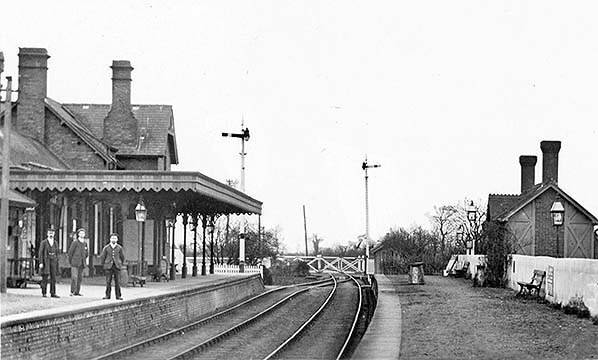 Nevertheless, like Quy, Bottisham was to lose its stationmaster as an economy measure in 1921 and the up platform canopy was removed around the same time. The down platform was 360ft long and had an ornate waiting room similar to that at Barnwell Junction; brick with ornate woodwork, a central doorway and fireplace at each end. It originally had a gable over the doorway but this was removed at an unknown date. An oil lamp was provided at the doorway but mounted to one side of it and the roof appears to have been of tiles instead of slate. 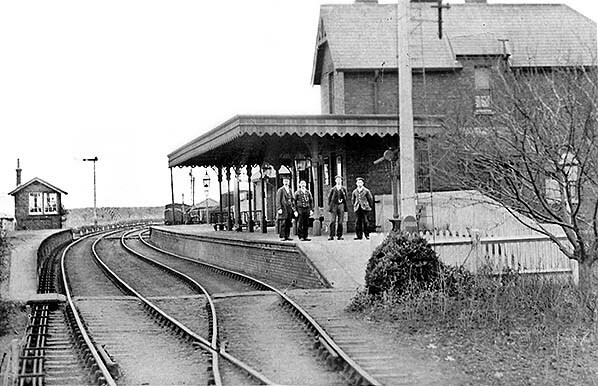 The up platform, 350ft, contained the station building and stationmaster's house. Two staff cottages were provided, on the up side near the level crossing but set some way back from the line. Quy excepted, station buildings on the Mildenhall branch all bore a family resemblance, so to speak. The single-storey range contained a booking hall, stationmaster's office, waiting room, toilets and staff room. The L-plan brick building included a two-storey stationmaster’s house with the single-storey range attached. On the two-storey section, facing the forecourt, the principal gable was under a half-hipped roof, and a slightly recessed section adjoining the office range was treated to its own pitched gable with timber braces. The door of the office range which gave access to the booking hall was sheltered by a gabled porch supported on brackets, and beyond it was a large unadorned gable. There was one doorway to the platform from the booking hall and waiting room with a second doorway serving as the Way Out from the platform. Gents' toilets were entered from the platform while access to the ladies’ toilets would be from the waiting room. Separate brick lock-ups were provided, apart from at Quy where a smaller lock-up was provided within the building. Fireplaces were provided in each room with semi-ornate stepped chimneystacks on the roof. Although this broad description applied to all branch stations apart from Quy, the finer details varied from station to station as did orientation according to whether stations were on the up or down side. 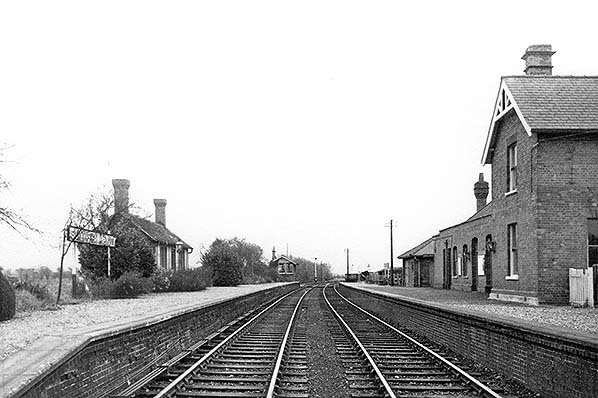 Both platforms remained in use until the end of passenger services and Bottisham signal box remained open until the goods service was withdrawn in 1964. When the goods train was shunting, the brake van was most likely left on the running line east of the station. The loop through the station was 600ft long. Goods facilities were located on the up side at the country end of the up platform and with a cattle and loading dock behind the platform. Apart from additional pointwork as required owing to the continued existence of the loop, the general layout was the same as that at Quy, but with refuge and dock roads both being 250ft in length and the headshunt 60ft. The refuge road was generally used by coal merchants. A loading gauge and weighing machine were provided; the latter was originally of 11cwt capacity but at an unknown date was replaced with one of 10cwt capacity. There was also a weighbridge of 5 tons capacity. The retention of the loop and signal box at Bottisham (and Burwell) after withdrawal of the passenger service may appear strange when economies carried out on the line over the years are considered; more so when it is remembered that the branch saw only one goods train each day and only in the up direction. The reason probably lies in the potential of the line as a diversionary route, although the last-known such occurrence was in 1960. In the early hours of Saturday 17 December a Whitemoor - Temple Mills coal train derailed near Stretham (between Ely and Waterbeach) and plunged down an embankment. From then until the late afternoon of Monday 19 December, down trains were diverted via Burwell and Fordham, thence to Ely. Up trains were diverted from Ely via Snailwell curve and Newmarket, thence to Cambridge. The operation required the opening of the Barnwell - Fordham section of the Mildenhall branch on the Sunday. 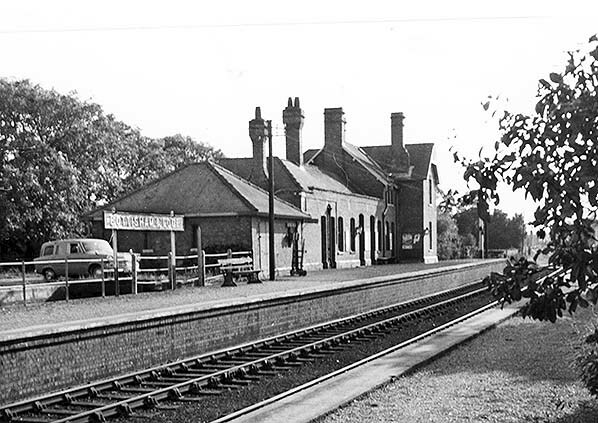 The Mildenhall branch arrived relatively late on the railway scene and it could be said that its existence was owed in part to the ill-fated Newmarket & Chesterford Railway (N&C). In 1847 the N&C, with its main line yet to be opened, sought powers to extend beyond Newmarket to Thetford, linking up with the Norfolk Railway, and to Ely and Bury St Edmunds. Of those, the Thetford link was never built; had it been built it would have served the Mildenhall area. This problem was frustrating Charles Allix (1842-1921) of Swaffham Prior House who approached the GER in 1867 with a view to the construction of a railway from the Swaffham Prior area into Cambridge. The GER rejected the proposal. The next proposal for a railway serving the Mildenhall area was for the ‘Ely & Bury Saint Edmunds Light Railway’, the company's deputy chairman being none other than Mr Allix. This railway was incorporated by an Act of 1875 and a reasonable amount of information has survived about it. Had it been built it would have served the Fordham and Mildenhall areas, but nothing came of the scheme and it was formally abandoned in 1880. Meanwhile back at Swaffham Prior, Mr Allix remained determined to see his region provided with a railway to help revive local agriculture which was experiencing economic hardship. It is said that every cloud has a silver lining, as Allix was soon to discover. The railway north of Cambridge and onwards to Brandon had suffered problems with flooding, and during 1878 serious disruption occurred once again. This time the GER 'brass' realized that Allix's proposal could, if built, help alleviate the problems, and thus the Mildenhall branch was finally born. While plans to build the Mildenhall branch were stampeding ahead, the GER had meanwhile re-engineered the vulnerable sections of the Ely - Thetford line. The GER therefore viewed an alternative route, i.e. via Mildenhall, as no longer warranted and this was the reason that the branch never progressed beyond Mildenhall. Back in the boardroom, the GER was inviting tenders for construction of the Mildenhall branch. With Royal Assent having been received on 18 July 1881, the relevant Act provided for three sections of railway: Barnwell - Swaffham Prior; Swaffham Prior - Fordham; Fordham - Mildenhall. Henry Lovatt, of Wolverhampton, won the contract for the entire route with his tender of £76,327 11s 8d. During October 1882 the contractor moved in to peg-out the course of the line, and on a cold and miserable Wednesday 3 January 1883 some GER grandees and Mr Allix assembled at – unsurprisingly - Swaffham Prior for the usual 'cutting of the first sod' ceremony. During 1883 the signalling contract was awarded to Messrs McKenzie & Holland with signal boxes costing £75 10s each, while local tradesmen were recruited for the erection of station buildings. The station building at Swaffham Prior was built in a somewhat different style from the others in order to mirror the design of Swaffham Prior House. The 19m 3ch route between Barnwell Junction and Mildenhall had no fewer than 70 level crossings. To put this into a less dramatic perspective, only seven were on public roads with the remainder being foot or occupation crossings. Major General Hutchinson inspected the Barnwell - Fordham section on behalf of the Board of Trade on 28 May 1884. Whilst the inspector found the general standard of construction to be high, a number of issues with fencing and signalling were noted. Permission was given for the line to open if these issues were dealt with quickly - which they apparently were. The inspector also required all trains to call at all stations. Inspection of the Fordham - Mildenhall section, on 28 March 1885, went well, with only a couple of issues at Fordham station. Otherwise, the inspector was impressed with the general standard of construction and gave his consent for the immediate opening of this section. Passenger services on the branch were never frequent although in the early years they were more or less on a par with other rural branch lines. Despite the possibilities offered by the connection at Fordham with the Ely line, the original timetable offered only four Cambridge - Fordham (and return) services stopping at all stations conforming to the Board of Trade inspector's requirements. Later that year, 1884, this was increased to five return journeys, Thursdays excepted. On that day, Ely market day, advantage was taken of the connection at Fordham and one train continued to Ely, the 12.30pm ex-Cambridge, which returned from Ely at 3.30pm. With the opening of the Fordham - Mildenhall section the following year, five return journeys travelled the full length of the line although on Thursdays one did not operate between Cambridge and Fordham, and vice versa. Tuesdays and Thursdays saw an additional Mildenhall - Fordham (and return) service but at different times on each of those days. Timetables do not indicate that these trains continued to/from Ely so they were probably connecting services. By 1890 there were additional Thursdays-only/excepted services plus one mixed train. Things then trundled on in much the same fashion until the first decade of the twentieth century. Despite increases in traffic, especially following the opening of the Fordham - Mildenhall section, the GER was perpetually worried about poor traffic receipts for the line. In 1914 the GER's James Holden decided to experiment with Push - Pull trains as a cost-cutting measure. He borrowed drawings from the London, Brighton & South Coast railway of their Westinghouse (compressed air) Push - Pull control system and converted Y65 2-4-2T No. 1311 and two clerestory bogie coaches into a Push - Pull train with further conversions following later. This train operated trials in service on the Mildenhall branch from 5 October 1914 but the experiment was not considered a success. The First World War brought considerable extra goods traffic to the line as a result of the government urging farmers to produce more food, but otherwise the war had little effect. By 1922 the timetable showed just three trains per day operating via Burwell, with the first down train not departing from Cambridge until 10.30am. There was, however, an earlier service to Mildenhall via Newmarket which left Cambridge at 6.47am. In an attempt to encourage more business, on 20 November 1922 the GER opened three halts on the line at Fen Ditton, Exning Road and Mildenhall Golf Links. They were on the up side of the line, i.e. on the left side of Cambridge-bound trains, and on the Cambridge side of adjacent road overbridges (Bridges 2236, 2242 and 2257 respectively). They were rudimentary affairs: a footpath led down the embankment from the road to end at a low cinder 'platform' faced with what appears to have been old sleepers. The Railways Act of 1921 saw the GER become part of the London & North Eastern Railway (LNER) on 1 January 1923. On this date Mildenhall Golf Links Halt was renamed Worlington Golf Links Halt. The ‘Halt’ suffix appeared in timetables and on tickets but not on the halt nameboards. As the halts had no proper platforms, the GER introduced carriages fitted with retractable steps. Initial conversions were of increasingly antiquated 6-wheeled stock. Because the halts lacked booking facilities the GER introduced ‘conductor-guard’ working, and for this purpose the carriage stock had to be modified to allow the guard to move through the train. Tickets from Quy were also issued on the train. The LNER viewed the former GER system it had inherited as something of a millstone around its neck and considered the withdrawal of a number of branch passenger services in the east of England. At around the same time the LNER made further economies by reducing the status of Quy and Swaffham Prior signal boxes to shunting frames. In 1935 these two boxes were abolished altogether and at the same time the goods loops through these stations were lifted. World War Two broke out in September 1939 and this brought some increase in traffic to the Mildenhall branch. As with the First World War, the line saw an increase in agricultural traffic and, as indicated above, of military personnel using the line. Goods traffic vital to the war effort was generally routed from Cambridge via Newmarket during the night. Nevertheless, the need for the railways to focus assets where they were most needed meant that services on the Mildenhall branch remained infrequent. For the duration of hostilities there were still three trains per day each way with the first down train operating via Newmarket. Two goods trains per weekday were provided, one of which commenced from sidings at Coldham Lane Junction, Cambridge. After the war things returned to pretty much the way they had been previously. On 1 January 1948 the Mildenhall branch became part of the Eastern Region of British Railways. Bradshaw for that date shows three trains each way: down trains at 6.33am, 10.28am, and 4.27pm; and at 7.42am,11.50am and 5.48pm in the up direction. The 6.33am ex-Cambridge omitted the halts, but did call at Quy, and all trains ran via Burwell. By the 1950s there were four passenger trains per day, the final departure being at 9.00pm from Mildenhall, omitting Worlington and operating via Newmarket to Cambridge. The BR 1954 timetable tells us the service had reverted to that of January 1948, as outlined earlier, apart from slight re-timings. From November 1955 diesels made their first appearance when two brand new sets of Metropolitan-Cammell 79xxx DMUs were sent to Cambridge for timing trials: E79047+E79263 and E79051+E79278. These trials included the Mildenhall branch, commencing on 20 November. By this time more Mildenhall services ran via Newmarket, plus the occasional service from Ely to Mildenhall which involved a reversal at Fordham. From 7 July 1958 diesel railbuses were introduced on Mildenhall branch services. These vehicles lacked retractable steps, as did the DMUs. For the halts, therefore, sets of portable wooden steps were provided and were usually left at the lineside to await their next call of duty. Goods traffic prior to 1962 was much as previously, with one train per day. By this time, goods trains were usually hauled by Brush Type 2 (Class 31) locomotives with J17 steam locomotives still putting in occasional appearances. The Mildenhall branch closed to passengers on and from Monday 18 June 1962, with the final trains running on Saturday 16th, there being no Sunday service. On the final day the first down train and its return up working to/from Mildenhall was operated by a 4-car Cravens DMU. A 2-car Wickham unit sufficed for the remainder of the day. The Wickham unit, E50416/E56171, operated the 4.21pm ex-Cambridge and this was the last passenger train along the Barnwell - Fordham section. This train then departed from Mildenhall at 5.15pm to Cambridge via Newmarket. The same DMU then operated the 5.56pm to Mildenhall via Newmarket and the corresponding 7.31pm Mildenhall - Cambridge via Newmarket; this was the final passenger train to and from Mildenhall. The Burwell & District Motor Service, having suspended its Mildenhall - Cambridge Service 11 at the outbreak of war, had reinstated the service at the cessation of hostilities but truncated it to operate only between Cambridge and Isleham, and it ran only on Saturdays and Sundays. Following withdrawal of the Mildenhall branch passenger trains, B&D modified Service 11 to operate daily and thus it became the rail replacement bus service. Following the end of passenger services, Isleham and Mildenhall signal boxes closed with immediate effect. The once-daily goods train continued to run, but in the up direction only between Fordham and Cambridge; the down goods ran from Cambridge to Mildenhall via Newmarket. The train was withdrawn on 13 July 1964, the final run being on Friday 10th. This left the Fordham - Burwell section which continued to enjoy a goods service until it was withdrawn on 6 April 1965. Fordham station and its neighbour, Soham, closed on 13 September 1965, and Fordham signal box closed on 28 October 1973. Tickets from Michael Stewart. Route map drawn by Alan Young. Bradshaws from Nick Catford. Click here to see a 17 minute colour film of a steam locomotive travelling from Cambridge to Mildenhall in 1959. Includes all the stations on the line, From Cambridge Community Archive Network. A postcard view of Bottisham & Lode station looking towards Quy and Cambridge. The date is unknown but it is probably after 1897 when Lode was added to the name, and certainly prior to 1902 as by that date the home signal (that on the right) had been moved to the up side of the line and mounted on a shorter post. The height of the signals was for sighting purposes but the up starter must have been difficult to see from a locomotive standing at the platform owing to the presence of the canopy. It would, however, have been interlocked with the level crossing gates. The level crossing was No.17, immediately beyond which was bridge 2238. Note that the level crossing was of the 4-gate type. The down platform waiting room still has its doorway gable at this time. 1902 1:2,500 OS map shows the layout of the station and goods yard. The main station building is on the up side along a short approach road, and there is a waiting room on the down platform opposite. The goods yard comprises a single siding with a headshunt to the north, but it runs behind the north end of the platform serving a cattle dock with two pens. Access to the goods yard is from the station forecourt with a weighbridge at the entrance to the yard. The station is controlled from a signal box at the north end of the down platform. Two railway cottages are seen on the south side of the approach road. The curve of the platforms is not apparent on this map but is clearly seen in the photo below. Bottisham & Lode station looking towards Swaffham Prior and Mildenhall. The view is difficult to date but it is probably in the 1897-1902 period. The gentleman on the left of the group appears to be the stationmaster. Around this time the position was held by Francis Hopkins (1896-1900) and Jonathan Rice (1900 until abolition of the position in 1921). At the end of the down platform the 22-lever signal box can be seen and the goods yard appears to be quite busy. Three oil lamps are suspended beneath the canopy. The station layout was a little odd: with a train standing at the up platform the locomotive would occupy the area in front of the canopy, therefore waiting passengers would need to walk to the open air section of the platform in order to board the train. An undated, but probably c1950, view of Bottisham station looking towards Swaffham Prior and Mildenhall. Removal of the up platform canopy gives us a better view of the various doorways to and from the platform. Of the two nearest the camera, one will be from the booking hall and the other was probably from the waiting room. Of the two furthest doorways, one will be the gents' toilet but the purpose of the other is not known. Bottisham is recorded as having had a 'lock-up for small parcels' but as a larger lock-up was provided this detail remains unclear. On the down platform, the waiting room had by this time lost its gable. Beyond the up platform some wagons can be seen in the goods yard while the dock has yet to become embroiled in undergrowth. Bottisham & Lode down platform as seen from the Cambridge end of the up platform sometime during the British Railways period. By this time things were becoming very rustic and it would appear access to the waiting room might involve something of a safari. The signal box can be seen in the distance and the method of platform construction is apparent. The down platform road appears to have received some maintenance in the form of new coach screws. It is September 1956 and the view is from a train arriving at Bottisham's down platform. The train will be comprised of the ex-GER bogie conductor-guard stock. Trees and bushes are beginning to take over. It is a pity that the photograph is not in colour as the scene was, in all probability, quite delightful. The oil lamp beside the waiting room appears to have been lit. If so, evening must be approaching and the train will be the final service of the day to call at this platform. The shadows certainly suggest a September evening and the time of the final down train of the day. Note that the oil lamp is now mounted on a post and not onto the front of the waiting room. In September 1957 this view is from the down platform looking towards Cambridge. The level crossing gates have by this time been replaced with a pair of one-piece examples. Images suggest that, with the exception of the area in front of the station building, the platforms were gravel-surfaced. There is a group of people, some of them children, on the up platform and what looks like a member of staff walking along the track. Perhaps a train is due or had recently departed. This is the only photograph to have turned up showing any detail of the cattle dock behind the up platform. The small building on the extreme left was the weighbridge office. Also on the left is H C Casserley's famous car which appears in a number of his photographs. It was a 1934 Hillman Minx, registration number JY 4711. The car is rumoured to have lasted until 1960 when the newly introduced MoT test saw it off. The MoT test was introduced by Ernest Marples, the real axeman of the railways who stood back and allowed Richard Beeching to take the backlash. A September 1957 view of the station house and buildings from the approach driveway. This is a good view of the front of the former stationmaster's house. Note the side gate onto the platform. H. C. Casserley's car is visible again, this time in a different position which suggests deliberate efforts to include it in his photographs. Above the car, part of the lock-up building can be seen. In the right background are what appear to be railway wagons but no plans have been seen which show a siding at that point. As the line was on a curve, perhaps the view is deceiving. On the left, the fence posts are either of wood or concrete rather than those supposedly made from contractors’ rail. 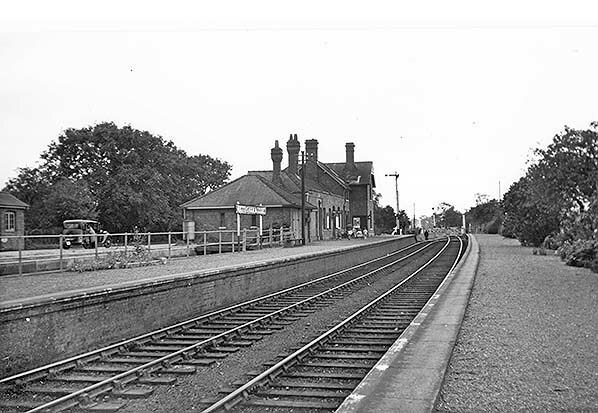 Bottisham & Lode up platform and station building viewed from the down platform sometime in the late British Railways period. The car on the left is a Standard Vanguard Vignale estate, a model introduced in October 1958. Stations which had their platform canopies removed never looked quite right and Bottisham was no exception. Of course, waiting passengers, when there were any, had a waiting room to shelter in.